What goes into each leg of the world’s finest ham? How is it best experienced? Where should you book your next trip? 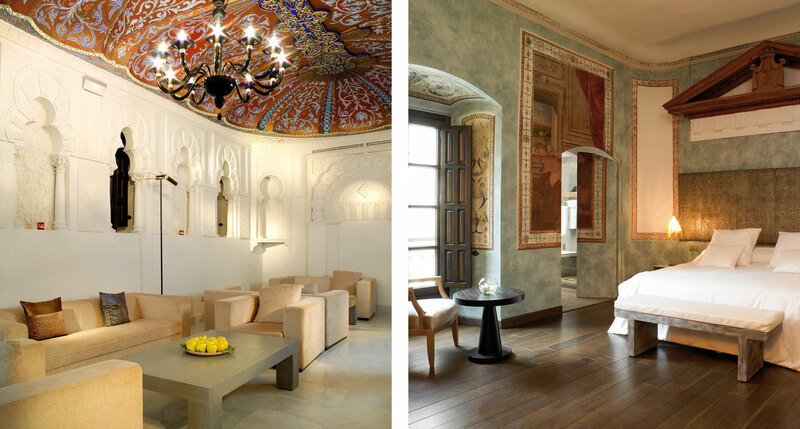 Take a seat and prime your appetite for this 6-part tour of the pride of Iberia. Jamón ibérico. 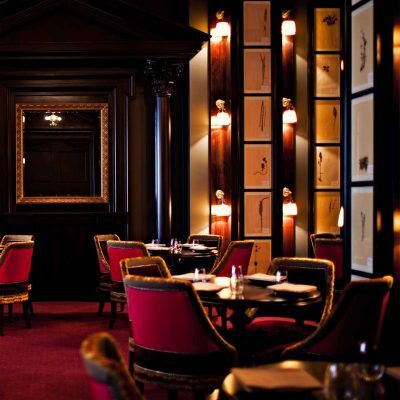 The very words set gourmets and epicures to salivating. 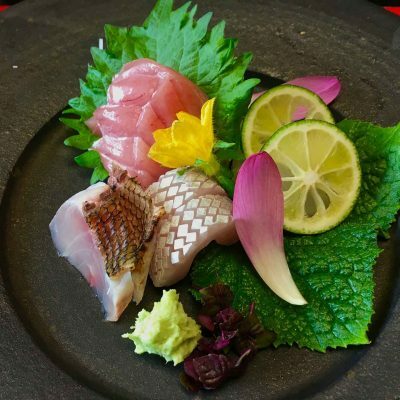 It exists on an echelon with Beluga caviar or Wagyu beef: symphonically rich on the tongue, fastidiously produced according to time-honored customs, always subject of culinary legend. And, yes, exorbitantly expensive. What goes into each leg of the world’s finest ham? How is it best experienced? Where should you book your next trip? Take a seat and prime your appetite for this six-part tour of the pride of Iberia. Jamón ibérico comes from the black Iberian pig — pata negra (“black hoof”) to the locals — descended from wild Mediterranean boars and native to the Iberian Peninsula. Modest litters and unusually long rearing periods make for a rare and costly breed, though only the loftiest governmental label requires purebred meat; at least 50% ibérico ancestry makes the cut. Traditional husbandry keeps them deeply intertwined with their ecosystem, freely roaming and foraging acorns from the montado or dehesa, the countryside sparsely dotted with oak groves. There’s an interesting dichotomy at play here: on one hand, they’re prone to feeding to the point of obesity, developing the extensive intramuscular fat that manifests as exquisite marbling in the final product; on the other, they get plenty of exercise, thereby developing fine bones, another sought-after feature. Keeping these factors balanced is a painstaking and lucrative enterprise, as any porquero worth their curing salt will attest. They’ve earned a right to be proud; these elite pig farmers sustain traditions central to the identity of their hometowns, and they’re as jealously proud of the quality of the dehesa as vintners are of their terroir. Production centers around the regions of Extremadura and Andalusia in southwestern Spain and Alentejo in south-central Portugal. “No expense spared” might as well be the theme here, especially when one accounts for EU regulations permitting no more than one pig per hectare. After an initial fattening period for piglets, the adult pigs subsist on a diet of primarily acorns supplemented by fragrant herbs, both major selling points for jamón of the highest quality. The acorns lend sweet, nutty undertones to the flavor of the meat itself and oleic acid to the fat. The variety of regional oaks provides for an extended acorn season from September to late March, with an “acorn intensive” called the montanera between October and January to bulk top-tier pigs up to the EU-mandated 160 kilograms. By numbers, that’s at least 200 oak trees per field, up to 20 pounds of acorns daily, and a per-pig foraging range of around 14 kilometers daily. After the slaughter (or sacrifice, as it’s called), porqueros brine both pairs of legs with Andalusian sea salt for about one day per kilogram, though only hind legs are used for true jamón ibérico. A thorough rinse comes next, followed by hanging and drying for up to six weeks; the all-important fat keeps the ham from going brittle. At this point it becomes more art than science: anything from weight to diet to target price to age-old family secrets can inform the length of curing, though typical ranges fall between one and four years. About half the ham’s weight in water and extra fat drips off as it cures fully. Climate control ensures consistency in the final product, with some producers lovingly rotating the hams through rooms exposed to mountain breezes. Determining factors — heritage, diet, range — are taken quite seriously, with pedigree books and restrictive marketing rules to ensure honesty. Enthusiasts justify these astronomical standards by pointing to jamón’s inimitable qualities: smooth texture, copious fat with textbook marbling, and succulently savory flavor. It is without a doubt the go-to ham for American foodies, as evidenced by explosive demand once the USDA legalized imports in 2007; in fact, all the attention has swelled herds in recent years. 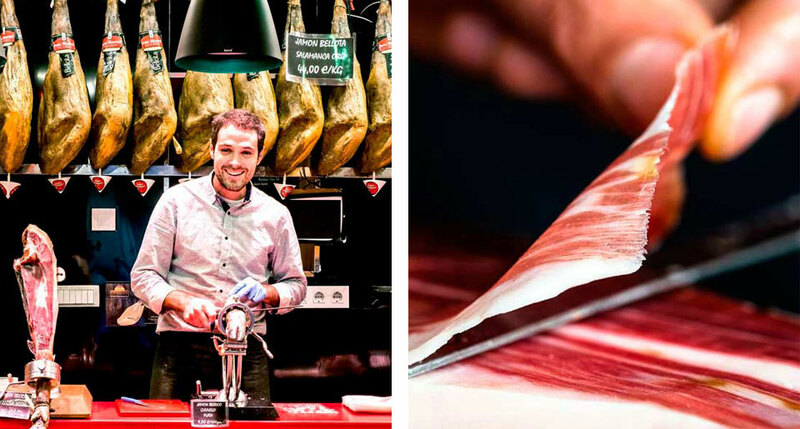 Whether you find it in an upscale market or a Spanish specialty purveyor, be sure to ask for your jamón ibérico to be sliced by hand, assuring even portions cut with finesse. Presentation is easy: cut a decent hunk of crusty bread and go to town, or serve a portion by itself for a crowd-pleasing appetizer, or pair it with fresh produce and manchego to up the salt factor. You’ll want it at room temperature, so let it warm out of the fridge for an hour before serving to let the fat relax properly. And it’s convenient that Spain is known for its red wines as well. 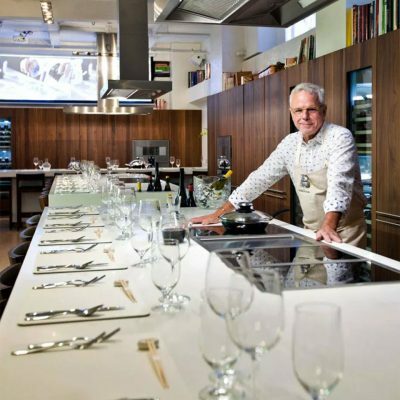 As the name may suggest, the dining is largely the point at Atrio, which neatly synthesizes contemporary architectural and design elements into its building’s venerable stonework. Your eyes will feast, too, in other words: on originals by Warhol and Baselitz, on historic Cáceres, on the oak forests these blackhoofs call home. 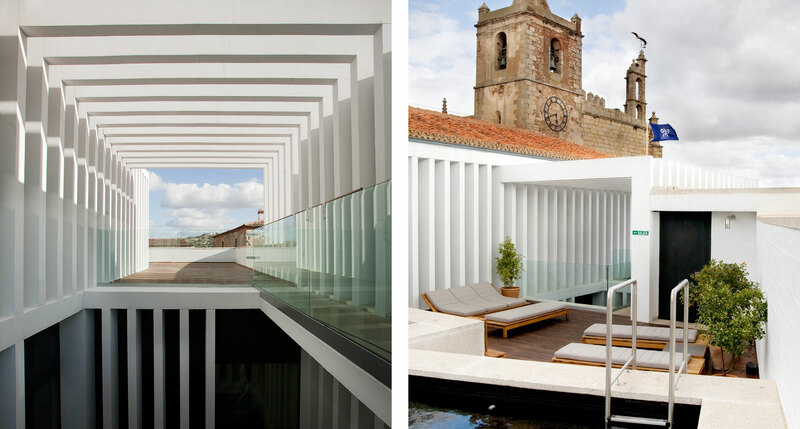 How does one architecturally match the flawless pedigree and divine succulence of jamón ibérico? 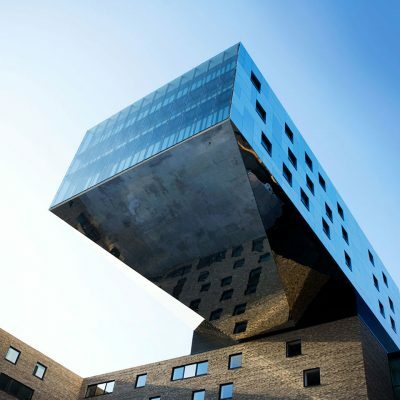 With this hotel’s show-stopping atrium, featuring a glass floor suspending guests over the ruins of a Roman-era villa. Or with century-old frescoes and antique stone arches in the guestrooms. The idea, however it’s presented, is to prime the mind to think historically, marveling at the scope, endurance, and resonance of human achievement. 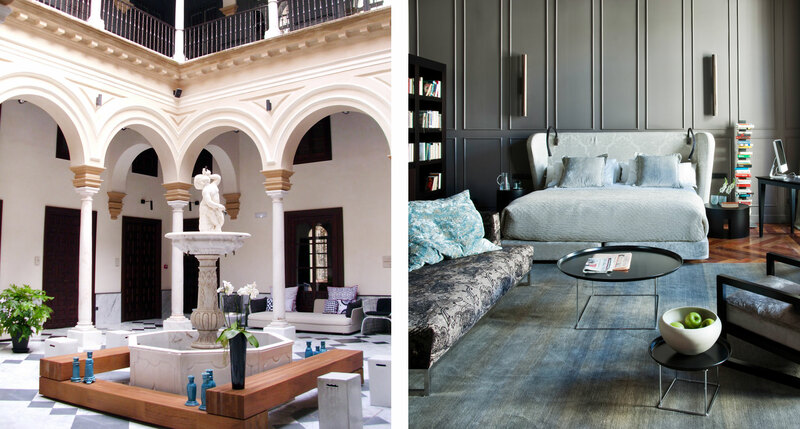 Mercer Sevilla is the perfect vehicle to reinterpret its Andalusian roots — floods of Mediterranean light, with airs of sequestered luxury and a weakness for the ornate — in the 21st century, riffing on established forms with contemporary furnishings and a white-on-white palette. Start with the courtyard and amble your way up to the rooftop pool and bar, the better to take in the lay of the land. As long as the food on your plate exhibits captivating colors and structure, the building might as well follow suit: drawing heavily on Moorish Mudéjar sensibilities, this 18th-century Santa Cruz mansion has stood the test of time with aplomb. 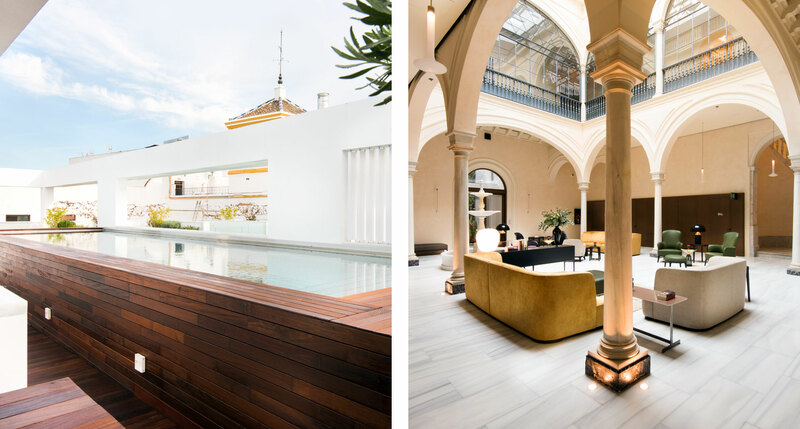 A few stylish tweaks remind us of the present day, but situated as it is at the conflux of contemporary Seville and Old Town, this particular palace can’t help but be the center of the action. Coastal Portugal shouldn’t get all the credit, and Pousada do Crato may very well be the soul of that argument: here we have a 14th-century castle-slash-monastery-slash-palace placed like a chess piece in a patchwork landscape of farmland, vineyards, forts, and quaint churches. It’s a truism that such origins yield equally glorious cuisine. Turn on, tune in, and tuck in. 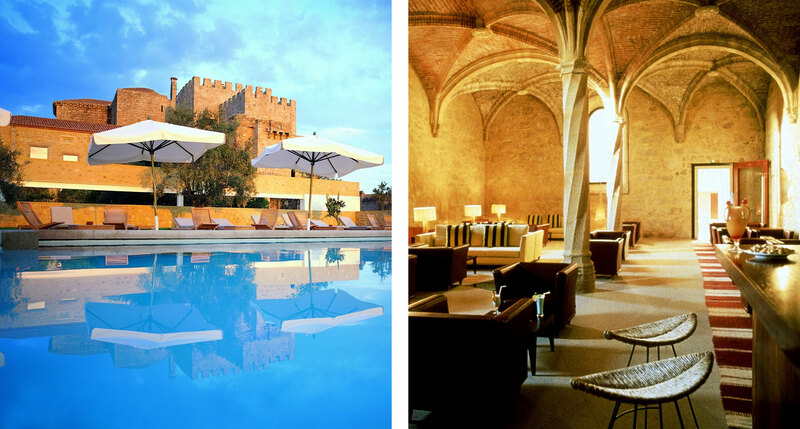 You don’t just have to wistfully think about the life of a 14th-century aristocrat; here you can live it, savoring fine local wines and perfecting your equestrian talents as you absorb centuries’ worth of the good life via osmosis. 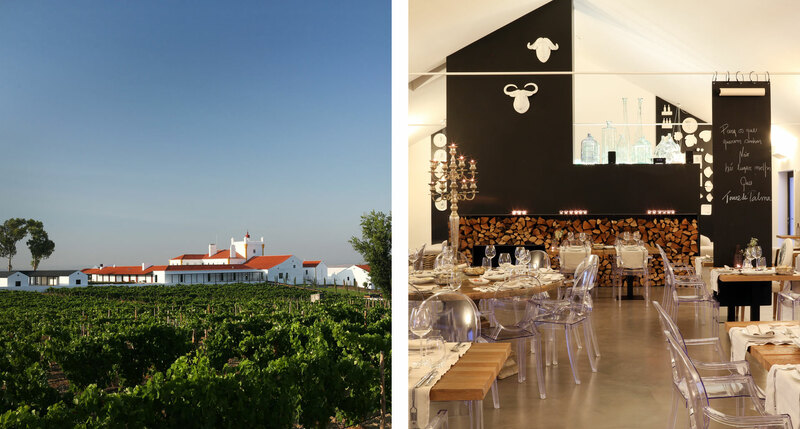 The romance and significance reach their zenith at Basilii, the restaurant named for the estate’s ancestral family, wherein expert chefs plot a new and delectable course for Alentejo flavors. 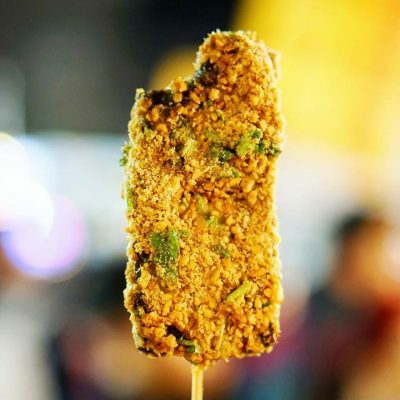 We’d like to give special thanks to Journy & Mimo Food for their contribution to this story.